Fidelity recently updated their estimate for what a retirement age couple will need to have saved for health-related expenses in retirement. The most recent estimate of $280,0001 is up 2% from last year which is below the average increase of 4% since the number was first estimated in 2002. 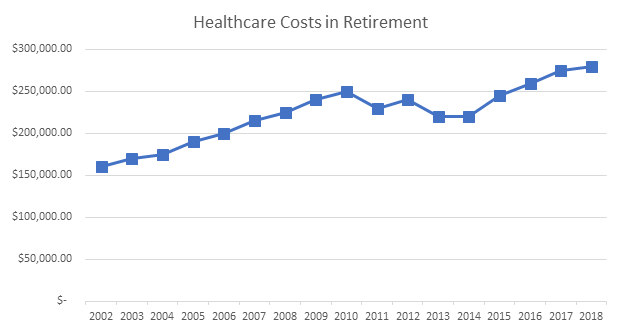 Fidelity highlights a few drivers of the continued increase in retiree health costs, namely people retiring before they are eligible for Medicare, and the pace of healthcare inflation. Both factors contribute to the roughly one third of early retirees also claiming Social Security early to cover healthcare expenses2. According to Fidelity “if you can postpone retirement or save enough to cover health care costs until 65, then you may be able to defer your Social Security benefits. Generally speaking, the longer you can wait until age 70 to take Social Security benefits, the more you can collect”. Those with HSAs or other tax-advantaged accounts are best positioned to fill the healthcare savings gap and avoid sub-optimal Social Security decisions. But only HSAs let you contribute, invest, and withdraw your healthcare dollars tax-free. Over the long-term that means HSA investors should be the most effective savers for retirement healthcare expenses. However, HSA investing may not make sense for everyone. Many accountholders choose to use the account for an immediate discount on current health expenses and may not accumulate a large enough balance to benefit from investing. 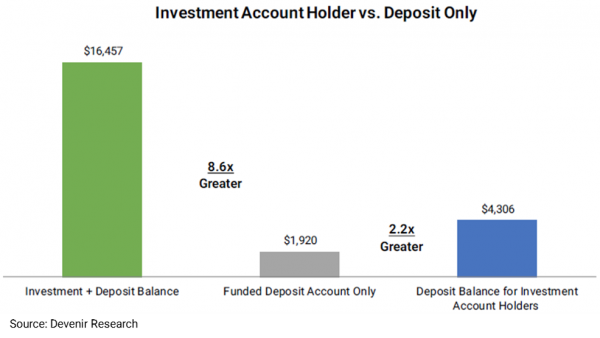 On average, HSA investors hold over an 8x larger balance than deposit only accounts3. As health costs make up a growing piece of the retirement savings pie, pre-retirees may want to evaluate their savings, health, and retirement income needs to determine if they can benefit from an HSA. Stay tuned to the Devenir blog for ongoing updates and insights into the HSA marketplace! 1 According to Fidelity “Estimate based on a hypothetical couple retiring in 2018, 65 years old, with life expectancies that align with Society of Actuaries’ RP-2014 Healthy Annuitant rates with Mortality Improvements Scale MP-2016. Actual expenses may be more or less depending on actual health status, area of residence, and longevity. Estimate is net of taxes. The Fidelity Retiree Health Care Costs Estimate assumes individuals do not have employer-provided retiree health care coverage, but do qualify for the federal government’s insurance program, Original Medicare. The calculation takes into account cost-sharing provisions (such as deductibles and coinsurance) associated with Medicare Part A and Part B (inpatient and outpatient medical insurance). It also considers Medicare Part D (prescription drug coverage) premiums and out-of-pocket costs, as well as certain services excluded by Original Medicare. The estimate does not include other health-related expenses, such as over-the-counter medications, most dental services and long-term care”. Investments are not FDIC Insured and may lose value. The information above is intended to be used for educational purposes only and is not to be construed as investment or tax advice, or as tailored to any specific investor. Consult a financial advisor or tax professional for more information. This information may be affected by the laws of particular states and there is no guarantee this information will be consistent across all states. Alabama, California, and New Jersey may impose taxes on HSA contributions, earnings, and dividends. Additionally, New Hampshire may impose taxes on HSA contributions. Data used may be estimates and may not reflect actual observed data.